New Kids’ Bike Shoe Review Available! 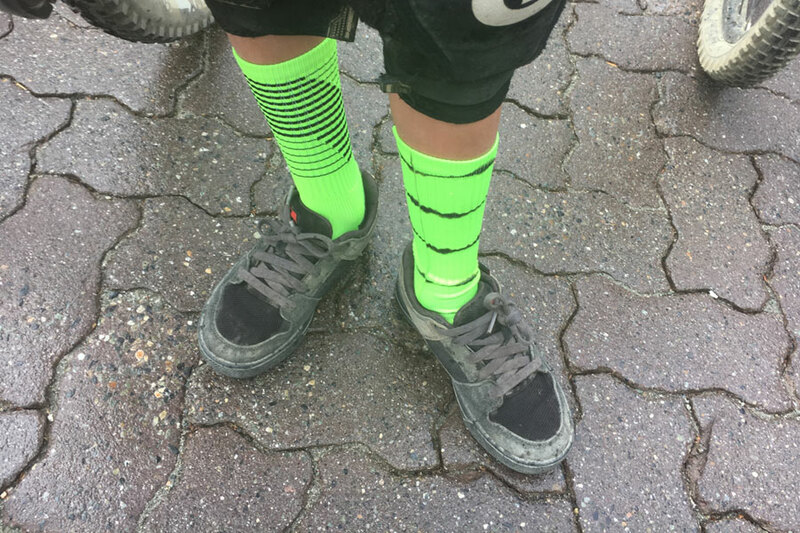 Our 11 year old grew out of the Five Ten Freeriders shown on this page so we had to get him a new pair of mountain biking shoes. 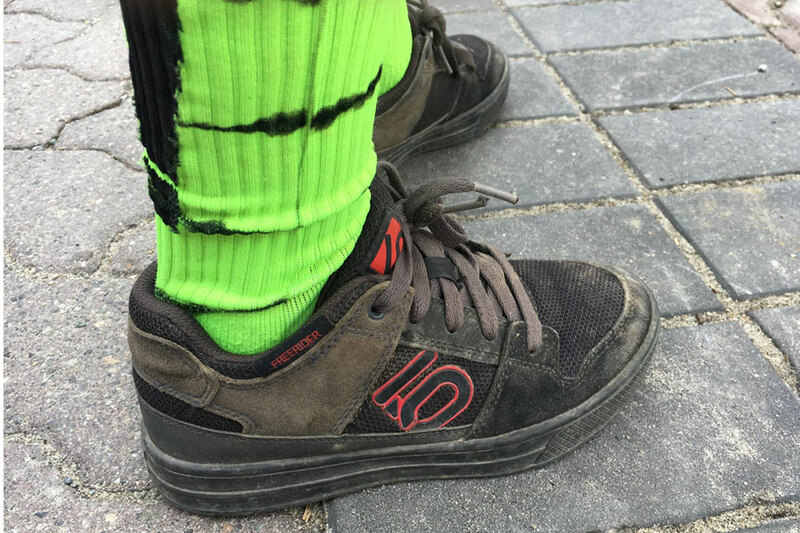 Follow the link to learn about the Five Ten Freerider Contact shoes he has been wearing for the 2018 season. Over the course of two weeks, he rode ’em hard every day and never complained about them being uncomfortable. Do your little ones need to have specialized shoes for mountain biking? Probably not. 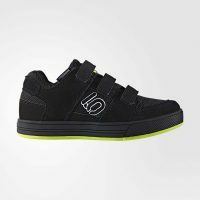 Can shoes like the Five Ten Freerider Mountain Bike Shoes for kids make a positive difference in the experience of riding a mountain bike? Absolutely! Brett purchased his initial pair of Five Tens several years ago. After he got them, he kept recommending that I should get some too. I was skeptical to say the least. $100 for shoes that I would only wear while mountain biking seemed like a waste of money. After some time, I gave in and bought the women’s Freerider shoes. It was amazing to feel the difference that the shoes made to my riding. The stiff, flat soles on the shoes make full contact with the pedals helping to achieve a planted feeling. 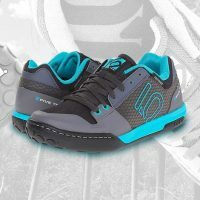 Five Ten has been making rock climbing shoes since 1985 and they’re famous for producing shoes that feature their high-frication Stealth rubber on the soles. Their mountain biking shoes have amazing grip as well, while the shallow tread allows for easy foot repositioning when needed. We decided to purchase Five Ten Freerider Kids mountain biking shoes for our children early last year. Our youngest currently wears the size 2.5 US and our oldest wears 9.5 US. After two seasons of riding in them, the shoes have become an essential part of their cycling gear. Both kids appreciate the “grippiness” of the soles, which have decreased the number of times they slip off the pedals. In our opinion, the toe boxes of the shoes seem to be wider than most. For our kids’ duck-shaped feet, this makes the shoes more comfortable. They still do slip a pedal now-and-then, and the result can look like a scene out of a horror film. Immediately following a gory mauling of the shin, we ask if they want to start wearing shin pads. They always refuse. 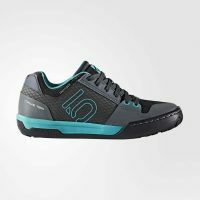 Five Ten Freerider Contact available in women’s sizes 5-11 at Adidas Outdoor. 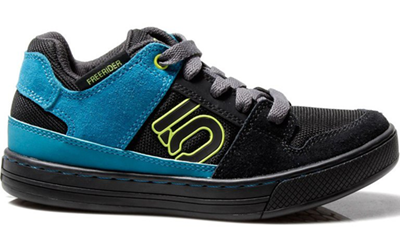 Five Ten Freerider VCS available in kids’s sizes 2-10.5k at Adidas Outdoor. 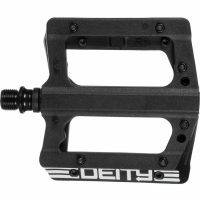 Deity Components Compound Pedal available at Backcountry. 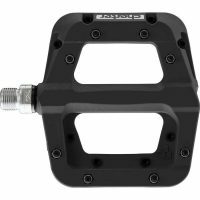 Race Face Chester Pedal available at Backcountry. The links above are for affiliate partners. That means if you click on them and make a purchase, we earn a small commission. Read more here. 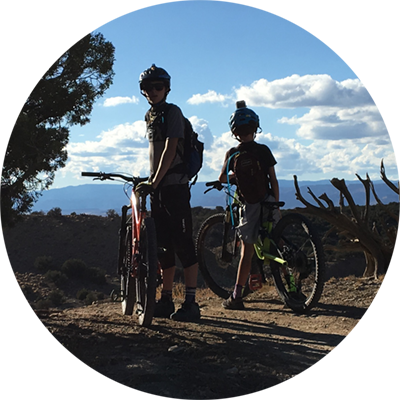 What Our Boys Say About Their Five Ten Freerider Mountain Bike Shoes for Kids..
Flat mountain biking pedals with metal pins are also a necessity for these shoes to perform their best. Standard metal “rat-trap” or thick plastic plastic molded pedals with the orange reflectors on them will not take full advantage of the tacky Stealth rubber on the soles of the Five Tens. We currently use flat pedals with pins on our younger son’s bike, a Trek Fuel Ex Jr.
Our boys can be hard on shoes – so much so that we have burned through skate shoes in the span of a few months. However, since we opted to buy big, we are on the second year of use of these shoes (pictured) and they barely look worn. All of us are careful to only wear our mountain biking shoes only for biking so the soles don’t get unnecessary wear-and-tear. The uppers are made with suede leather and mesh. The shoes perform well off the bike providing decent traction on dirt. And of course, excellent grip on rock and pavement. 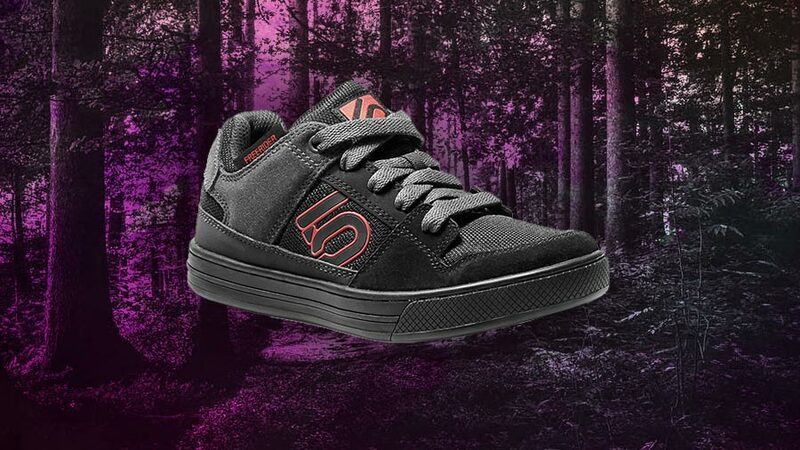 If your family rides several times per month, the Five Ten Freerider Mountain Bike Shoes for Kids shoes may make riding even more fun. 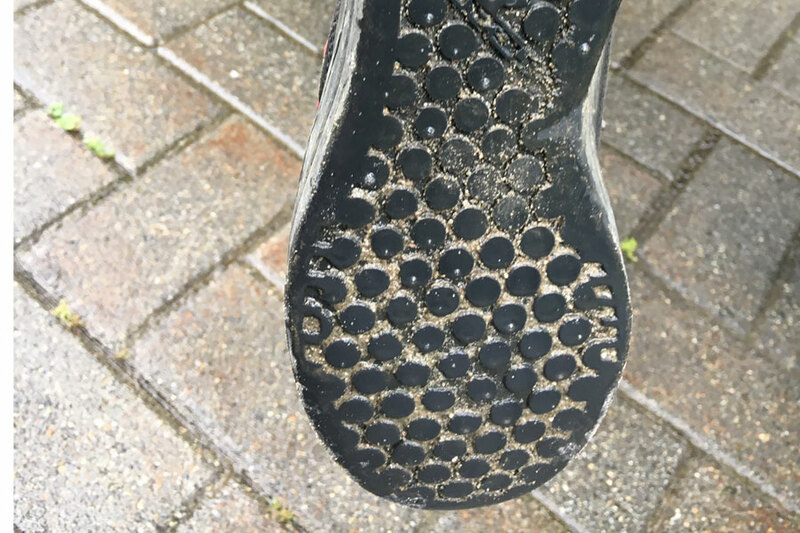 The only issue we have had with these mountain biking shoes is that the long laces don’t seem to stay tucked in the shoes well for our younger rider. The laces loose laces have gotten caught on the bike/other objects a few times. If I were purchasing new, I’d buy the Velcro closure shoes for him. These are not cheap for growing kids. Like other youth mountain biking gear – you can clean them up and try to re-sell them. We have seen used kids’ MTB shoes like these for sale on our local online buy/sell websites and Facebook groups.